Since we announced Left 4 Dead in late 2006, the growing online community has been a great source of feedback and support during the development process. We're planning on using this blog to talk more directly with that community - through stories, artwork, and insights into our design and development process. There's also a Left 4 Dead forum where we're hoping you'll let us know what you think of the blog, the game, or anything else L4D-related. The game is finally nearing completion, and we're down to the final tweaks before it goes out the door. This week, we're all playtesting the Xbox 360 version of the game non-stop. There are two kinds of playtesting at Valve. There's the kind that happens throughout development, where we bring in people from outside the company, watch them tackle the game, and then make changes based on their experience. This weekend, expert Lego Builders from all over the world will convene in the Seattle Center Exhibition Hall for BrickCon 2008. The exhibition floor features a massive group project called the Zombie Apocafest, a giant, bloody urban zombie apocalypse rendered entirely in Lego. We got a sneak preview of it today, and it's awesome. Even more awesome, there's a Left 4 Dead billboard right in the middle of the action! Ah, good old BrickCon. Always cool stuff. A Contest so Easy, Even a Zombie Could Win. The guys over at Left4Dead411.com just launched a new contest today with the grand prize being four copies of Left 4 Dead. The contest is all about getting your picture taken in front of a horde of zombies. Where can you find a horde before November 18th? Left4Dead411 has plenty of tips. Just please remember to respect the native zombies, they get hungry for brains if you anger them. 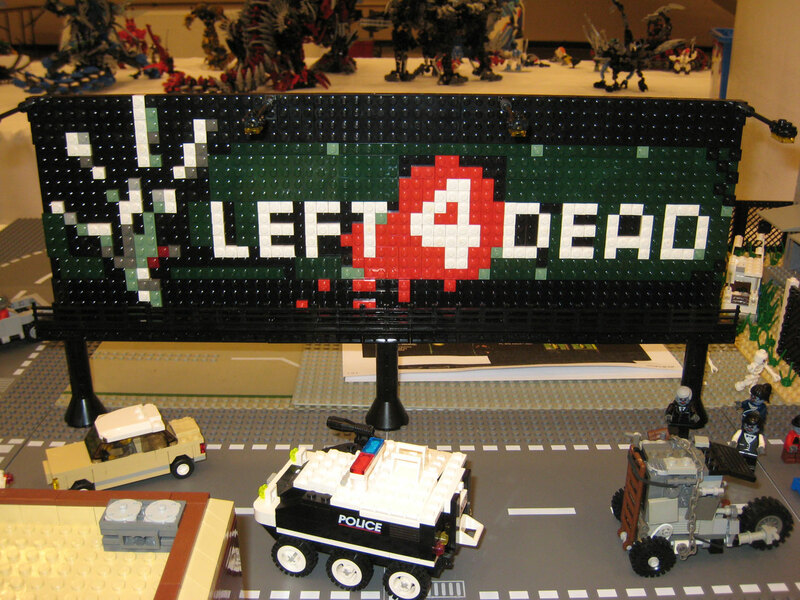 Photograph yourself in front of a zombie horde holding up the L4D salute or box art and if it's good enough you'll win four copies of Left 4 Dead for you and your friends! The bigger the zombie horde is the better your chances of winning. Where do I find a zombie horde? They're everywhere! Zombie walks are taking place all around the world the next few weekends. World Zombie Day is on Sunday, October 26th, 2008! Be sure to check it out for your chance to win a copy of L4D or an early access ky to the demo. i'd pay money to see Duke in his red jacket re-doing the Thriller video. February 5, 2008 — Valve, creators of best-selling game franchises (such as Half-Life, Portal, Team Fortress, and Counter-Strike) and leading technologies (such as Steam and Source), today announced a series of content and development releases for its latest title, 2008's best-selling new game property for the PC and Xbox 360, Left 4 Dead (L4D). The first L4D DLC — dubbed the L4D Survival Pack -- is due for release this spring and introduces a new multiplayer game mode entitled, Survival, plus two complete campaigns for Versus Mode . A Critic's Choice Edition of the game will be heading to retail stores this spring, and will include access to all the content introduced in the L4D: Survival Pack. In addition, for PC gamers and aspiring developers, the first Left 4 Dead release for the Source Software Development Kit (Source SDK) will allow the creation of custom Left 4 Dead campaigns that will be discoverable via L4D's matchmaking system. The SDK update is also due for release this spring, and is free of charge to all owners of L4D on the PC.